A bagel is a bagel is a bagel, right? Yes, a bagel consists of baked dough with a hole in the middle. But, a true New York bagel is nuanced, precise, and balances a fine line of perfection that is glossy and crunchy brown with a dense, chewy inside. Fluffy and airy, leathery and tough are words that should never be associated with bagels. Just as the West Coast of the US has struggled for generations to bring the East Coaster bagel to their shores, Melbourne has also gone through ups and downs in our search for the perfect bagel. Broadsheet helpfully lists quite a few of Melbourne's renowned bagel artisans, with Glicks being the long-standing favourite. However, Melbourne has never quite mastered the formula of dough preparation, high-temperature baking and boiling water of the right pH level that creates bagels that would pass a Noo Yawker's taste test. 5&Dime Bagel's bagels have street cred. Made by a New Jerseyan who wasn't happy with the bagels when he arrived in Melbourne a few years ago, 5&D make a point on their menu of letting you know that their bagels "are boiled and baked using traditional methods." Hidden in a laneway down the southwest end of the CBD near Southern Cross Station, between Flinders Lane and Flinders Street, 5&D isn't like the trending pop-up 'bagel shops' that are scattering around the city, where, upon entry it's clear they are just rebadged cafes. 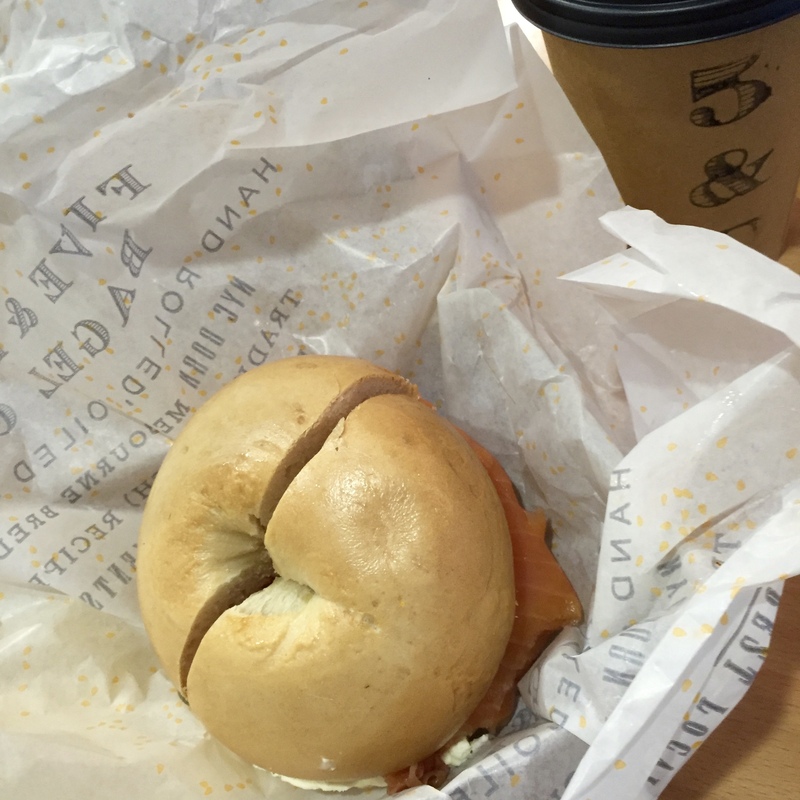 No, 5 & Dime is a little tricky to find down Katherine Place, which helps ensure only bagel purists find the grail. With glass frontage, before entering you'll see the cafe section, and next to it, separated inside by more glass, is the bagel factory. It takes up an impressive two-thirds of the real estate, and is fascinating to behold. From the countless sacks of flour to the boiling vats and tray-ovens, and bagel creators rolling dough swiftly and with machine-like consistency, it looks chaotic but clearly works. Enter the cafe doors and take a moment to smell the freshly-baked scent, before admiring the menu and bagels on display. Made with local ingredients, 5&D offer the traditional bagels like plain, rye, poppyseed, and sesame, as well varieties such as salty garlic, blueberry, dill, onion, cinnamon, and so on. There are spreads, such as peanut butter, jam, and PB&J, but please, we're here for the traditional experience, so enjoy trying to decide between the real cultured cream cheeses (sourced from Goldfields Farmhouse). There are a few other options on the menu as well, including a big selection of deli sandwiches served with potato chips and a pickle spear, pizza bagels, French toast and the infamous Black & White Cookie (a la Seinfeld). 5 & Dime's Instagram page is a helpful place to see what's new and exciting. 5&D's owner and original bagel master, Zev Forman, started out making bagels for the local farmers' markets around Melbourne. 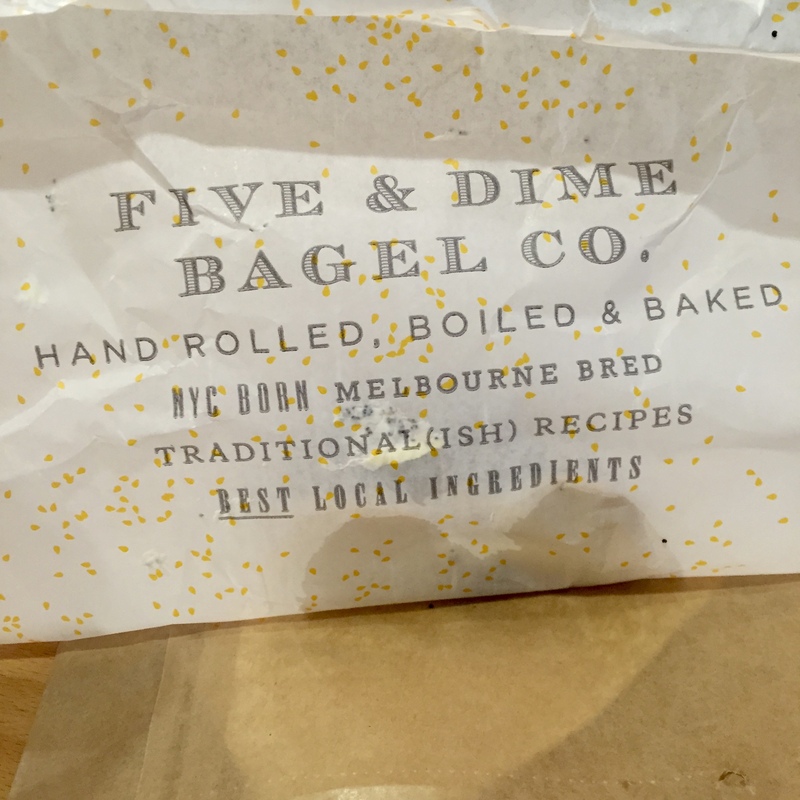 These markets are still a key distribution means of 5&D's magic bagels, and 5&D publish where to get their bagels around Melbourne's markets and cafes on their website (which was strangely in transition / down when I wrote this review - so try their new, incomplete site). If nothing else, the markets and cafes that stock 5&D bagels are the only source of these amazing bagels on the weekend, when 5 & Dime shut their doors (they're open 6:30am through 3pm during the week). 5 & Dime also provide catering services on request, via fiveanddimebagel@gmail.com. Demonstrating his understanding of his adopted home, Zev's cafe does offer filter coffee (Promised Land Coffee), and the baristas always turn out an excellent Melbourne espresso cup-ah-cawfee to accompany the grease paper-wrapped bagels. Another great article, Alexander, you're on a roll....mmmm, sorry bagel! I've never tried a bagel but it's on my bucket list now. After 22 years in the US I know a good bagel when I taste one - and the BEST bagels in Melbourne are New York Bagels. I always go for the ET (EveryThing) bagel which has all the tasty seeds (poppy, sesame and also garlic) on BOTH sides which is the kicker in my opinion. If you only want half a bagel for now, you don't have to decide to eat the top or the bottom because they're equally good! NY Bagels don't have a store front but you can buy them at markets around the city including the Queen Vic. I buy mine at Preston Market.